Serving Brampton and surrounding area, Ontario, Canada. Please call 905-866-7485 to place your order. Downloadable order forms coming soon. Do you have a question you would like answered? 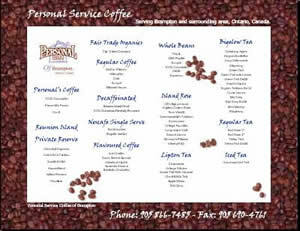 ©2000-2011 Personal Service Coffee of Brampton.